A few weeks ago, I received the sweetest package in the mail from The Silver Maple. Diana and I had been in contact regarding personalization ideas. After I gave her some ideas, Diana put her creative skills to work and created a necklace made especially for me. A necklace that I will cherish for a very long time. First impressions say a lot. The packaging for my new necklace was simple and adorable. And the personalized, handwritten card was so sweet! Let's just say I was already impressed before I set my eyes on the gorgeous new piece of jewelry made especially for me. This necklace symbolizes three major accomplishments in my life - first and foremost, my children. Then there's the 26.2. Taking the leap to do a marathon, well, three actually, required a lot of time, strength, and support from my entire family. Simply stated, The Silver Maple has gorgeous jewelry options, all personalized and handcrafted. They specialize in jewelry for yoga, running, and triathlons. But it doesn't end there, they also make inspirational jewelry and other personalized items - even flatware. It's all beautiful and personal. If you have a birthday or special celebration coming up, I'd definitely look at The Silver Maple. The prices are really reasonable (with a flat rate shipping fee), the quality is amazing, and the end product is gorgeous. 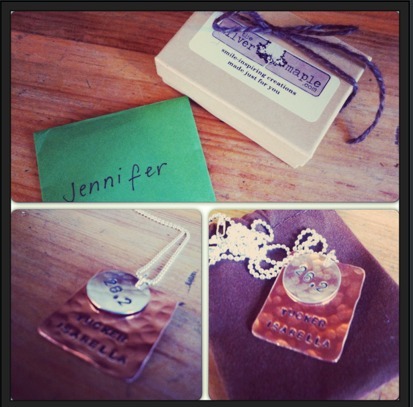 Disclaimer: I was sent the personalized necklace from The Silver Maple for the purpose of a review. As always, all opinions expressed on my blog are 100% my own. So gorgeous! I love The Silver Maple. You are welcome! I only spoke the truth! So very pretty! I wear it all of the time! I wouldn't say "only" done halves!!! Halves are still hard and long! A Race on MY TIME! What's Colorful & Fun? #ColorMeRad5k Of Course!